바른 보잉을 도와주는 활 교정기 입니다. 연습시 악기와 활의 손상이 없습니다. Dennis Leogrande, to assist students to produce a straight bow. 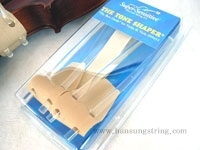 The Tone Shaper® comes with velcro fasteners and instructions. There are no sharp points or pressure to cause damage to the instrument.